I realized I never could change my ethnicity/race. I also developed a pride in being Korean and Asian. I reviewed things I liked about being Asian that European Americans did not have. I also grew comfortable with things I did not like about being Asian. As an adult I learned how to deal with racism/stereotypes in a way that makes me feel OK about being a “border person” and a minority. As a social worker, I immediately recognized the position this beginning quote meant to convey – what we call a "strengths-based approach" to an issue. My impression is one of, "hey, we may have had some identity issues, but now we're okay!" I wonder whether if this had been written for an academic audience in a peer-review journal, if that would have been the quote that opened the report. It's a bias – one can never quite remove bias – and I believe was intentionally framed this way. I'm not going to give an opinion as to the merits of this approach, but I did want to begin stating this because I think it's important for people to understand that all research has its biases and limitations. The questions that are asked, the way the report is written – even the fact, as Sang-Shil writes in her blog post here, that if this is about adult adoptees, why are children featured prominently on the cover? say something about the way a research study is framed. I look at this study from multiple perspectives – as someone who fits the demographic of the study participants, as a social worker who has worked in the adoption industry, and as a new researcher. Some of the feedback I've been reading centers on the idea that the findings aren't anything "new." Well, I both agree and disagree on that point. I agree that the results don't seem surprising to anyone who has been around a lot of transracial adoptees. If you've read my blog, or any of the other Korean adoptee/transracial adoptee blogs, or read Outsiders Within or participate in some of the Yahoo groups like IAT, then no, these findings are nothing new. We (meaning adult transracial and transnational adoptees) have been speaking out publicly for a good 20 years or so now. When I read the results, I just nodded my head in affirmation, like a non-verbal "yep." From a research perspective, however, this report is significant, since in many disciplines these days (especially social work and psychology) the Very Big People want "evidence based research" and so this study goes a long way in providing some of that. Anecdotal stories are considered non-significant since they are just "one person's view." This study of 468 adult adoptees (of all race/ethnicity) so far is hailed as the largest sample of adult adoptees surveyed (and the Korean adoptees made up the largest portion of the adoptee respondents at 179 participants). This study now produces some "evidence" and even more important to me, evidence that reflects changes from some older studies that reported little or no struggle with identity for transracial adoptees. One of my big criticisms of a lot of the previous studies on transracial adoption is that the questions they ask and the measurement instruments that were used (that is, surveys or interviews) were either misleading (to me), or did not ask the kinds of questions I thought were important, or relied on adoptive parent reports about the adoptee's identity or asked children and youth themselves. Why would I think asking the child/youth a problem? I've said it before, but for those of you who haven't heard it before I'll state it again – when it comes to asking transracial and international adoptees (or maybe even same race adoptees) questions about adoption and identity, the questions often seems framed in ways that make me wonder if the adoptee would answer honestly. Remember, that for an adoptee there may be a subconscious worry that there is a "right" answer, and adoptees are often very protective of their adoptive parent's feelings. When I look at some of the older studies and see answers to different questions that seem to contradict each other, it makes me wonder if or how much the adopted child or youth answered more according to what s/he thought would be safe versus how they truly felt. I have no way of knowing and I could be way off base, but those are some of my concerns about some of the older studies I've read. I don't discount those studies all together, however, and I think it's important to consider the responses by younger transracial and international adoptees. I just think that we need to be critical thinkers and to realize that there are some limitations to those studies. 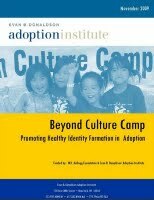 Beyond Culture Camp expands on the previous assumption that identity work is done mostly in adolescence and tapers off as the individual becomes a young adult. I was not at all surprised personally to see that in this study, the Korean adoptees reported that racial and ethnic identity development not just continues but grows throughout adulthood – 60% reported that racial/ethnic identity was important to them by middle school, 67% during high school, 76% through college and 81% by young adulthood. I might hypothesize that adult adoptees may feel less of a burden to answer in a way that protects their adoptive parent's feelings (of course, I could be wrong about that, but I think adults answering an anonymous survey would be more likely to be honest and less likely to try and protect adoptive parents). "most Korean adoptees grew up in communities that were less than 10 percent Asian, but almost half (47%) indicated there are larger numbers of Asians in their current communities. This shift also was reflected in the fact that 67 percent of the Koreans described the extent of diversity in their childhood communities as “not at all” to “not very much,” whereas many (42%) indicated there is “very much” diversity in their communities as adults. This indicates a shift for most from living in settings where they were very much in the minority as a child to living in communities with greater racial diversity. This change may be reflective of overall shifts in the American population, as well as the choice of Korean adopted adults to live in more diverse communities." (p.25). ave been adopted in 1988-1989 or so or earlier. One note – the NYT article and other folks have been writing as if this study was of the "first wave" or "first generation" of Korean adoptees, but that is not true. Many of us who study Korean adoption or are part of the Korean adoptee community would classify the first generation of Korean adoptees as those born and/or adopted during or in the first decade after the Korean War, so those from 1950-the mid 1960's. I just barely escape that designation because I was born in 1968. A few other notes about this study – the average age of the respondent was 31 years old, and 82% were women. Fifty percent married or partnered at the time of the survey, 26% had children and of those with children, 31% had adopted children (I find that fascinating and would like to see more research done on this topic!). Of the 88% of the respondents who had siblings, 74% of them had at least one sibling who was also adopted (although the findings do not specify if they were of the same race/ethnicity or not). It is important to keep in mind that the participants in this study are not a randomized sample and therefore the findings cannot be generalized beyond the scope of the study participants. For example the report states that 62% of the respondents belong to an adult adoptee organization, 73% are members of an adoptee listserve or e-group, and 49% had participated in an adoption conference. Frankly, that seems awfully high to me. It makes me wonder if these numbers reflect an active participation in adoption related organizations and groups led to participating in this study, and if so whether these findings say more about adoptees that interact with other adoptees. I wonder about the adoptees who are more isolated or don't care about or don't participate in transracial or international adoption related activities. 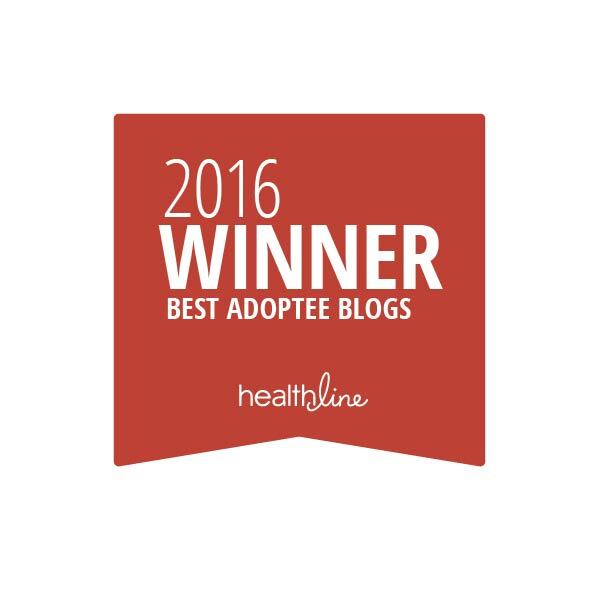 I myself saw the call for participation on several list-serves and on blogs and or adoption-related newsletters. So this ends my first blurb of random thoughts about the study, and I apologize if it doesn't flow well. I didn't really have time to edit it. Over the rest of the month I will continue to post on the findings of this study. This reminds me a lot of studies/consciousness raising around feminism, racism, classism, heterosexism…it doesn’t take too long–maybe 2-3 years–for someone to feel informed enough to forget those breathtaking moments of first discovery that lead us through something like the grief process toward acceptance. We need to keep supporting the writing and the research…each book or study has a lifespan but generations keep arriving who need the information all over again. Thanks for keeping it fresh JR! Thank you for the professional and personal insights. It’s much appreciated. I don’t think the study, nor the article say anything new that we haven’t already suspected for the past several years. Yet, because the mainstream media has covered it, and that the research is getting noticed…this is a step in the right direction. I am glad to hear that the study acknowledges that identity development continues into adulthood. Quite honestly, in my case, I didn’t even begin to touch the surface of my identity issues until my late twenties, early thirties, and now in my mid-thirties I am still wrestling through it all. I often refer to myself as a “late bloomer” regarding adoption issues. I participated in a couple of studies during my college years for some Master’s/Ph.D students. I answered honestly back then, but my answers to the same questions would be SO DIFFERENT now.